NSF files contain authentic NES music in all its 8bit glory. It is a direct copy of the music data from the Nintendo carts (similar to emulation roms, but with only the music information left). There are players and plugins that let you listen to this music on your computer. 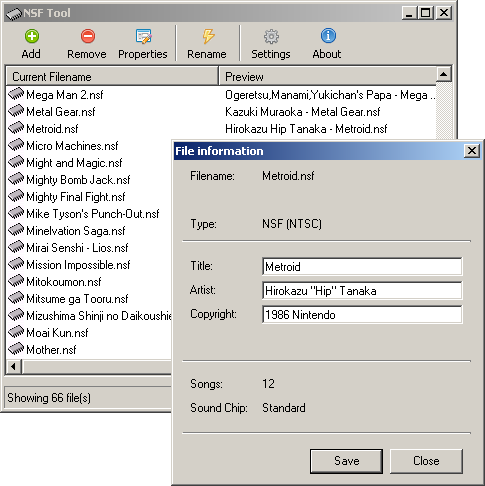 It is even possible to create new NSF-music with tools such as FamiTracker. If you want to download NSF music I can recommend a visit to Akumun's NSF Archive. To play NSF files you can use Audio Overload or one of the many WinAmp plugins. Edit metadata information stored inside NSF files, such as composer and title. Batch rename .nsf files according to this information to suit your taste. Both NSF and the slightly newer NSFe formats are supported.